Join us November 28, 2019 for a GOBBLIN’ good time in beautiful Ann Arbor, MI! Gobble. Gobble. 2018 Shirt and Medal! Fun!! Get into the holiday spirit before your Thanksgiving feast; run, walk or crawl with the whole family! Strollers are welcome but please leave your 4 legged friends at home. The Tot Trot 1K is perfect for the little ones (ages 10 & under), and the 5K is fun for the whole family. 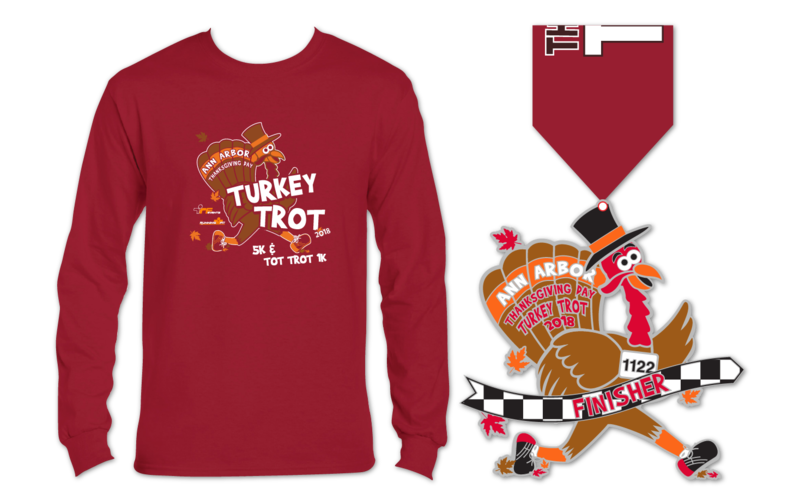 Hot chocolate in the finish line, pictures with Santa and Turkey Tom, a fun course and a fun afterparty! The Ann Arbor Thanksgiving Day Turkey Trot is proud to be supporting the ChadTough Foundation this year! A portion of all entry fees will go to the ChadTough Foundation and you are also able to make additional donations with your race registration!